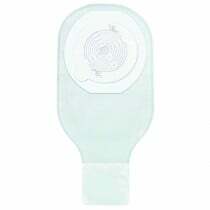 1 Piece Ostomy Bags BUY One Piece Ostomy System, Colostomy Bag, Urostomy Bag, Ileostomy Bag, Drainable, Closed, Filtered, Ostomy Bag. What Are 1-Piece Ostomy Bags? 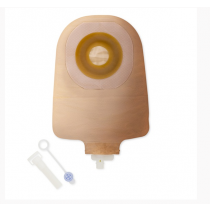 1-Piece Ostomy Bags combine the skin barrier (also known as a flange, wafer or base plate) and the ostomy bag into a single medical appliance. 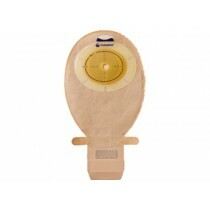 An adhesive around the flange attaches the ostomy bag to the area around your stoma. 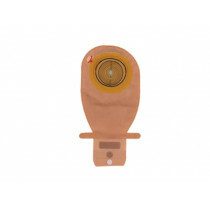 One Piece Ostomy Bag Systems are more convenient for most ostomy patients. 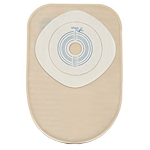 Single Piece Ostomy Bags provide more flexibility, less bulkiness, lower profile, less obtrusiveness, ease of securement and quicker application. 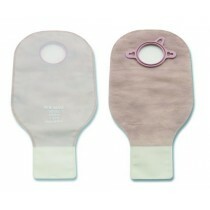 One Piece Systems also adhere more securely to scarred or uneven skin. For many the deciding factor for using a 1 Piece Ostomy Bag is reducing the time required to attach a new, clean ostomy bag to the stoma with greater ease of use. 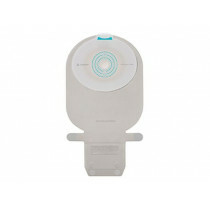 This simplifies the process of attaching ostomy bags, but also requires replacing the entire unit when needed. Adhesives create a seal against the body, minimizing leakage and discomfort. 1-Piece Ostomy Bags are available in many different sizes, shapes, and in reusable and disposable styles. 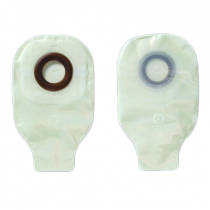 You may want to consider some of our most popular 1 Piece Ostomy Bags by ConvaTec, offering features such as a drainable outlet, and pre-cut stoma opened design. 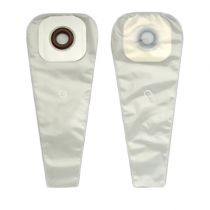 1-Piece Ostomy Bags come in many variations, including transparent, opaque, pre-cut, cut-to-fit, drainable and closed, filtered, non-filtered, with belt tabs or multi-chambered. Transparent ostomy bags are most often used following patient surgery to allow for easy visual inspection. 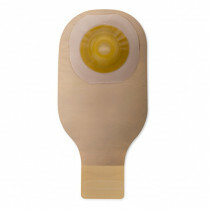 Opaque beige ostomy bags are used after an ostomy patient leaves the hospital and prefers a more discreet collection bag. 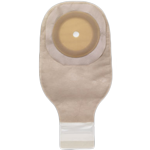 Pre-cut ostomy bags have a hole positioned in the center of the skin barrier, matching the size of the stoma. 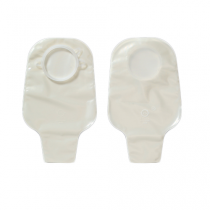 Cut-to-fit 1-piece ostomy bags allow the pouch to fit most shape and sizes of stomas for greater flexibility and adaptation to the individual patient. 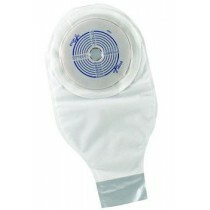 1 Piece Ostomy Bags are available in drainable or closed version. 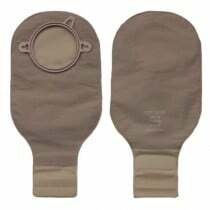 Drainable Ostomy Bags allow you to drain the contents of the ostomy pouch and continue to use the pouch for collection and storage. Closed Ostomy Bags on the other hand are disposable pouches designed for one-time use. Offering greater ease of use, closed system ostomy bags provide less risk of leaking and less risk of odor. 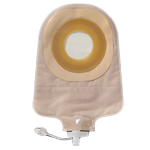 Filtered Ostomy Bags allow patients to bathe, swimm or exercise with a reduced risk of leaking. 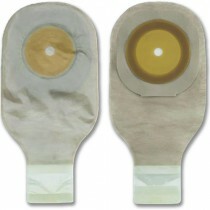 Ostomy Bags with an integrated filter allows for continuous venting without liquids penetrating inside or outside the pouch. Multi-chambered ostomy bags offers patients a noise reducing option. Belt tabs provide additional support for ostomy bags to keep them secure against the body. You may choose to use an ostomy pouch with a belt tab if you feel that you need extra support and security while wearing your bag. Many pouches have built-in belt tabs that provide extra support and a higher level of security for a completely comfortable user experience. Belt tabs can also aid with support for hernias, prolapsed stomas and bulges. Complete your ostomy care with a belt tab such as the Ostomy Appliance Belt by ConvaTec. Select from many top-end manufactures such as ConvaTec, Coloplast, Hollister and Genairex for the best 1 piece ostomy system to fit your lifestyle! More information about an ostomy or stoma can be viewed at the following webpage: Ostomies and Stomas. Let's have a look at how to prepare the ostomy adhesive before application to the skin. The hole in the adhesive must fit precisely to the shape of the stoma. If the hole is too big, the skin around the stoma is exposed to the effluent from the stoma and may be damaged. If the hole is too narrow, the adhesive cannot adhere to the surface of the stoma. A hole that is too narrow might also damage the stoma. For custom cutting the hole in the adhesive, you will need a stoma guide, a pen and a pair of curved scissors. The diameter of the stoma will change over time so make sure you always keep a close eye on the size of your stoma. 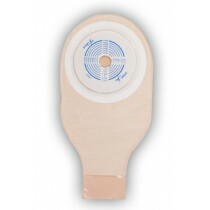 To measure the diameter of your stoma, use the stoma guide. Try the different pre-cut holes in the stoma guide to find the hole size that best fits your stoma. If the hole is too big, the skin will not be protected properly. If the hole is too narrow, the adhesive will not adhere properly. The whole must fit precisely to the size of your stoma. 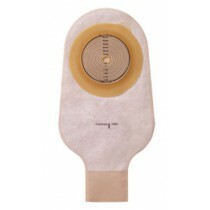 If your stoma is oval, measure the different diameters of the stoma using the half circles of the stoma guide. 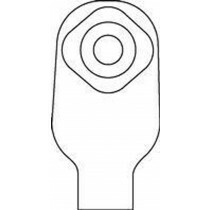 Having measured the size of your stoma with the stoma guide, use the stoma guide to draw cutting line matching these measurements on the backside of the adhesive. Pull away the bag a bit to make sure you don't damage the bag itself while cutting the hole. If your stoma is regular and you know the diameter of the stoma, just use the pre-printed cutting guide on the backside of the adhesive. If you don't know the diameter, use the stoma guide. Pull away the bag a bit to ensure you don't damage the bag itself while cutting the hole. To cut, use of pair of scissors not too big and preferably with a curved shape. When you remove the protective film, you can use it as a guide for the next time you prepare an adhesive.